Hot Spots. They’re here. The new question type that will have a direct impact on assessments AND student outcomes. Now that we have them, let’s chat about how to leverage these items to better engage students with course materials to improve student preparedness for summative assessments and standardized exams. Check out the five methods below to learn more! At all levels of education, it is important to prepare students for what’s next in their academic or professional careers—we’re preparing elementary students for the next grade, high school students for SATs/college, and college students for their careers. Throughout each of these levels, there is the constant balancing act of preparing students for standardized exams while also making sure they learn course content. In a perfect world, we would do both at the same time. Enter Hot Spots. 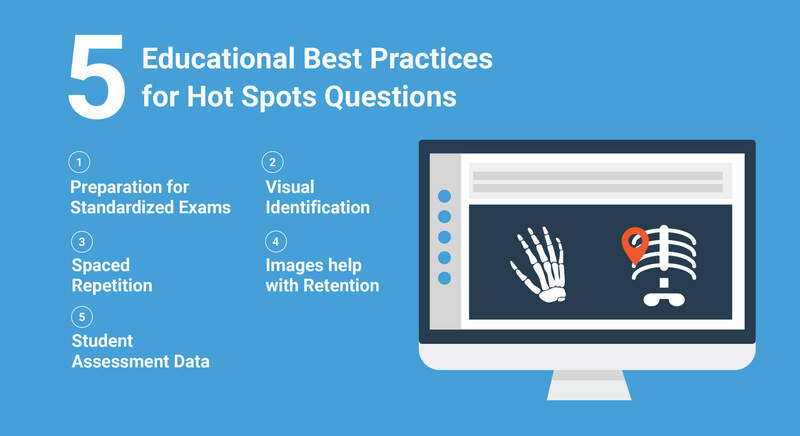 Through Hot Spots questions, students can be assessed on course and standardized exam content while getting the visual repetitions needed to prepare them for what’s next in their academic careers. Best practice tip: Use these low-stakes, engaging formative assessments to drive learning by visually familiarizing students with course and standardized exam content. That’s right, Hot Spots items can be used as assessment for learning AND as student practice. Spoiler alert for Best Practice Tip #4 below: teaching with visuals improves student outcomes better than written content alone. Okay, we all know this is that fastball right down the middle that Hot Spots questions hit out of the park. Need students to identify a location on a map, part of a cell, or a geometric shape? How about assessing students in a more real life scenario? Field trips and site visits are rare opportunities, but we can still actively engage students and prepare them for future success by teaching and assessing them in this practical way. Don’t forget about those formative assessments though! As you retire Hot Spots questions from being used on exams, turn them into practice exams for students to use outside of class. Best practice tip: Use Hot Spots items as follow-ups to multiple choice questions on both formative and summative assessments. 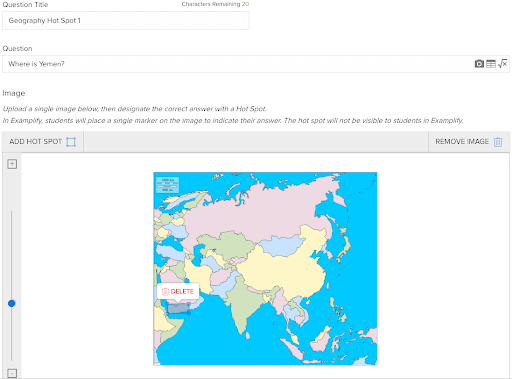 For example, create a multiple choice question on the content intended, followed by a Hot Spots item prompting students to visually identify the appropriate item. There it is again—that fine line between productive repetition and boredom-inducing redundancy. It is a struggle to find appropriate ways to revisit content without losing students in the process. How about … wait for it … we achieve these goals with Hot Spots? Educational research indicates that having planned repetition over an extended period of time leads to better retention. Low-stakes formative assessments using Hot Spots items throughout courses and the curriculum will create this repetition while not overwhelming students with too much content. Best practice tip: Create practice Hot Spots formative assessments for students to take on their own as they advance through your course(s). Use your assessments to provide necessary feedback to students on their performance, allowing students to learn how to self-assess their performance. Want to see if your internal student assessment data is in line with the studies referenced in this blog post? You can do that! Just like all other assessment items, Hot Spots items can be tagged to categories to learn more about student performance. Don’t stop there—evaluate student performance in areas that correlate with standardized/licensure exam content. This method allows us to identify in which content areas students struggle most and then create a data-driven remediation plan for each student. Best practice tip: Use this data as proof that these new instructional and assessment methods are improving student outcomes on your internal exams…and better preparing students for standardized exams (don’t forget to record this as a scholarly activity for your CV!). Hot Spots are more than just a question type. They’re a catalyst for improving our assessment practices and driving improved student outcomes at all levels of education. Isn’t that our end goal as educators?